Rinse the beans in a colander, removing any debris. In a large bowl (or the pressure cooking pot if you prefer) soak the beans overnight in 8 cups water mixed with 1 tablespoon salt. When you are ready to cook the beans, drain and rinse the beans, discarding the soaking liquid. In the pressure cooker, using the sauté feature, heat a tablespoon of cooking oil. Add in the bacon and cook, stirring frequently, until the fat has rendered and the bacon has crisped. Remove the cooked bacon into a bowl and set aside, leaving the bacon grease in the pot. Add the onions into pot and cook in the bacon grease until the onions have softened, about 3 minutes. Add the remaining ingredients (2 cups of water, molasses, ketchup, brown sugar, Worcestershire sauce, mustard seeds, smoked paprika, pepper and salt) into the pot and stir to combine. Stir in the soaked beans. Close the lid and pressure cook at high pressure for 35 minutes. Turn off the heat and natural steam release for 10 minutes, then use the auto-quick pressure release for any remaining pressure. Open the lid carefully and check several beans to see if they are tender to your liking. If not, set the pressure cooker for a few minutes longer. Season with more salt if desired. Stir in the cooked bacon. Select the reduce / sauté function and simmer the beans uncovered, stirring occasionally, until the sauce is the desired consistency (my preference is about 5-10 minutes). As the beans are pressure cooking, prepare the sautéed garlic mushrooms. In a medium-sized cast iron or other heavy bottom pan over medium-high heat, fry the olive oil and garlic, stirring frequently, until golden brown, about 6-8 minutes. Transfer the garlic and oil to a small bowl and set aside. Quickly wipe the pan with a paper towel to remove any excess oil. Turn the heat to high, and add in the mushrooms (without any additional oil, fats or salt). Fry, stirring occasionally, until the mushrooms have browned and are just starting to release their liquid, about 4-5 minutes. Add in sautéed garlic, thyme and salt. Continue to cook until the mushroom water has cooked off and the mushrooms are tender. Top a slice of buttered bread with a ladleful of beans and a heaping spoonful of mushrooms. Pressure Cooker Baked Beans adapted from Pressure Cooking Today. Sautéed Garlic Mushrooms adapted from I'd Rather Be a Chef. 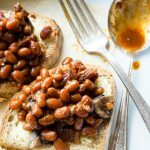 Get this recipe for Pressure Cooker Baked Beans on Toast (GF) at https://www.theworktop.com/breakfast-brunch-recipes/savory/pressure-cooker-baked-beans-toast/.